Millions of Americans use deductions to lighten their tax burden. But one lesson of Wednesday night’s debate between President Barack Obama and Republican presidential nominee Mitt Romney is that those deductions might be in jeopardy – no matter who wins the election. They disagree on income tax rates, but one policy on which Obama and Romney agree is limiting the use of tax deductions and other tax preferences. And 2013 seems to be shaping up as the first chance for fundamental tax reform since 1986. The chairmen of the two congressional tax writing committees will be as important in shaping that reform as the president will be. If Republicans keep control of the House and Democrats retain control of the Senate, those two chairmen will be Rep. Dave Camp, R- Mich., and Sen. Max Baucus, D Mont. 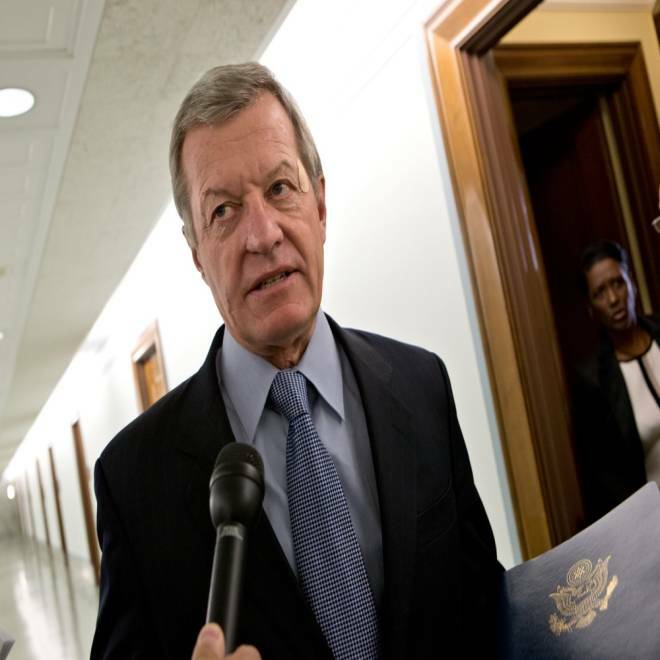 Senate Finance Committee Chairman Max Baucus, D-Mont., on Capitol Hill in Washington, Wednesday, Sept. 19, 2012. That “tangible benefit” is the crux of the debate over deductions and other tax preferences. Congress wouldn’t have created each deduction if it didn’t have a specific policy purpose it was pursuing. And Washington wouldn’t be filled with tax lobbyists and other advocates if companies, industries, and non-profit organizations didn’t know they needed to defend their specific tax break and argue that it has a tangible benefit. If proof were needed of the tenacity of interest groups in defending tax preferences, consider what happened in 2009 when Obama proposed in his first budget plan to limit the use of tax deductions. The interest groups (the non-profit sector, the home builders, etc.) were able to defeat Obama’s attempt in 2009, and they might be able to scuttle any similar proposal in 2013. For now, there’s only the most general agreement between Romney and Obama – both men say they want to limit the use of deductions and other tax preferences. While Romney hasn’t committed himself to a specific plan to limit deductions, Obama has offered a detailed plan as part of each of his budget proposals since he became president. The Democratic incumbent proposes to limit the tax benefit of deductions for taxpayers with taxable income in excess of about $213,000 for individuals and $266,000 for couples who file joint tax returns. Sen. Kay Bailey Hutchison, R-Texas, weighs in on the Romney tax plans and the state of the economy. The staff of the Joint Committee on Taxation illustrated how Obama’s limitation would work: Assume a taxpayer in the 36 percent tax bracket for 2013 makes a $10,000 contribution to a charitable group. Under current law, the $10,000 contribution results in a $3,600 tax savings. But under the Obama proposal, the same $10,000 contribution by the same taxpayer would result in a tax savings of only $2,800, thus forcing him or her to pay $800 more in income taxes. As for Romney, “His point is first and foremost, ‘I want to cut (income tax) rates and then I’m going to pay for it by getting rid of other things in the tax code – reducing the value of itemized deductions, getting rid of some exclusions – in order to bring enough revenue in to fill the hole that I dug with (income tax) rate cuts,’” said Roberton Williams, a tax analyst at the Tax Policy Center in Washington. In not offering specifics on his plan to limit deductions and other tax breaks, Romney likened himself to Ronald Reagan, who when he ran for president in 1984, “laid out the principles that he was going to foster,” as Romney said, but didn’t provide detailed plan. But Reagan did offer a specific tax reform proposal in early 1985. Romney Campaign Senior Adviser Ed Gillespie joins Morning Joe to discuss some of the nuts and bolts of Romney's plans for tax reform. Which loopholes would Romney close as president? Romney has proposed to scrap the Alternative Minimum Tax – the parallel tax system that limits the ability of higher-income people to use deductions to lower their tax liability. But he indicated in Wednesday night’s debate that he’d hit higher-income people perhaps even harder than the AMT does by denying them deductions entirely. Romney has now floated three different possible limits on deductions – $17,000, $25,000 and $50,000 – and while also saying he would entirely eliminate tax deductions for some upper-income people. To get a feel for how a $25,000 limit on deductions might affect taxpayers, consider that for those who take itemized deductions the average amount deducted last year was $25,769, according to the Tax Policy Center. But the average is heavily skewed by the fact that high-income taxpayers take such large deductions. For those in the top one percent of the income distribution, the average mount deducted in 2011 was more than $173,000. The vast majority of taxpayers have deductions which total less than $20,000. For itemizers in the middle of the income distribution the average amount deducted is about $16,000. GOP presidential candidate Mitt Romney steps out of turn to point out errors he feels President Barack Obama made in describing his tax plan. Of course for many taxpayers none of this is directly relevant to their own tax situation since two-thirds of taxpayers take the standard deduction and do not itemize. But they too would be affected by a change in tax policy that, for example, caused Americans to give less money to private schools, colleges, museums, and charities. Diana Aviv, president of Independent Sector, a nonpartisan coalition of nonprofits, foundations, and corporate giving programs, said if under a Romney plan, deductions were limited to $17,000 or $25,000 and if much of what the taxpayer was deducting was mortgage interest and state and local taxes, then charitable deductions might be squeezed out. Aviv said for people who itemize, how much money they give to charity “is entirely correlated with the tax incentive … There’s a mountain of evidence to show that the charitable tax incentive adds to the volume that people give. So we will see massive cuts in the level of giving to charitable organizations” if Congress limits deductions.